Find out how to send U.S. Postal Service (USPS) domestic Priority Mail Express through UCSD Mail Services and recharge the cost to your department index. 1. Determine if USPS Express Mail will meet your mailing needs. Note: If you want to send your mail to an international destination, see How to Send USPS International Mail. 2. Get your Priority Mail Express supplies. See How to Order Mail Services Supplies. Complete the order form to get your free Priority Mail Express supplies. Note: Most items will be delivered to you within 24 hours. 3. Consider your insurance needs. For an additional charge, you can insure your Priority Mail Express item. In Step 5, list a declared value. 4. Complete an Express Mail label. Important: Express Mail will ship to P.O. boxes. 5. Prepare your Express Mail. Attach the Priority Mail Express label to your item. 6. Mail your Priority Mail Express. Take your mail to Mail Services, Campus Services Complex, Building A by 2:00 p.m., weekdays. 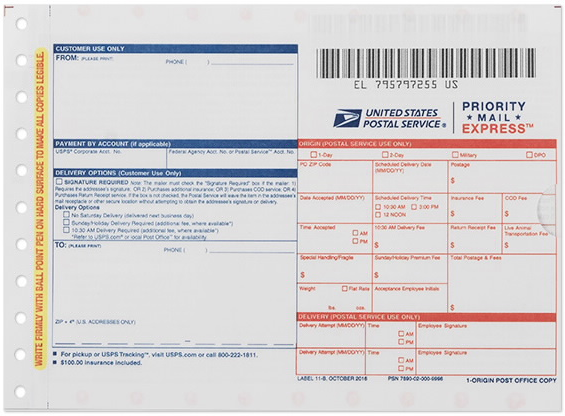 A copy of the Priority Mail Express label information will be returned to you. 7. Check yourPriority Mail Express charges. Read How to Check Your Mail Service Charges. For more information, contact Jorge Espinoza, (858) 534-5743.